Jesup, Georgia – The Yellow Jackets snapped a four game losing streak to non-region rival Brunswick (Ga.) Glynn Academy, outpacing their opponent by a tune of 29-14. Flexing its cumulative muscle was the Jesup (Ga.) Wayne County defensive unit which limited the Red Terrors to a mere 150 total yards. Offensively the Jackets were led by seniors Ashby Cribb and MJ Fuller. The dynamic duo accounted for all four scores and a two-point conversion. With the win Wayne County improves to (4-0) with non-region games left with Baxley (Ga.) Appling County and Hinesville (Ga.) Bradwell Institute before region play begins. The Red Terrors record drops to (2-2) with non-region road games at Waycross (Ga.) Ware County and Kingsland (Ga.) Camden County on the horizon. Both teams are still the favorites to capture their respective Region Titles. Below are some of the participants from this contest that displayed the size, athleticism and football acumen worthy of attention from college recruiters. Many of the standouts are not household names, but still deserving of recognition. Let’s face it, the big boys (FBS) are pretty much done with recruiting in 2019, but several FCS and DII programs are still in search of difference makers. Fortunately for the underclassmen, time is still on their side. Bacon is not only the largest defensive back on the Red Terror defense; he is the physical presence with the lone goal of intimidating ball carriers. On the night he recorded eight tackles, many of which were near the line of scrimmage. Midway through the fourth quarter when Glynn needed a stop, Bacon did his part racking up three solo tackles to stymie a Jacket drive. At this time he has no offers, but one would have to think they are on the horizon as defensive difference makers are hard to find in the day of explosive offenses. Bacon is someone that should be attracting FBS and FCS attention. With offensive yards hard to come by, Bostic was one of the few bright spots for Glynn Academy. The all-purpose back that doubles as a slot receiver carried the ball seven times for 66 yards. He possesses quick feet and has the speed to get the edge. Bostic runs with good balance and is a willing blocker in the run game. He may not be the biggest athlete on the field, but he does have incredible body structure. His size and athleticism will allow him to project as a possible slot, running back and return man at the next level. Lewis is not a household name yet, but he could be one day. The tall lanky signal caller does not get many opportunities to throw the ball in the Red Terror run dominated offensive attack, but when he does he leaves his mark. On the night he completed two passes on five attempts for 71 yards and a touchdown. He also carried the ball 10 times for 37 yards. Lewis can be very elusive in the pocket and he has the elegant elongated stride that allows him to gobble up yardage. He should be considered a legitimate dual-threat signal caller with the athleticism to project as a vertical receiving threat as a potential wide out. Without a doubt the most physically impressive prospect on the Glynn Academy Roster. Taylor has the size, length and athleticism to project as a strong side defensive end or a defensive tackle at the next level. Versus Wayne County Taylor recorded five tackles and two TFL’s. What’s impressive about his skillset is his ability to play lower than the opposing offensive lineman. He then flashes deceptive closing speed for a big man. It’s really hard to believe he has no offers at this time. His body type and physical attributes are rare. His stock could take off soon as the need for his position at the next level never ends, sometimes going past signing day. If there is a better go-to-guy on third or fourth down in Georgia, I’d be shocked. Cribb caught six passes for 84 yards and one touchdown while hitting pay dirt twice in the bunch set down near the goal line. Cribb has the knack for finding the weak underbelly in any defense. Even when covered he possesses incredible body control and very strong hands. Watching him contort his body on the touchdown catch was a thing of shear elegance. His body structure is superior to the average high school receiver and he has the toughness to make plays in front of linebackers. 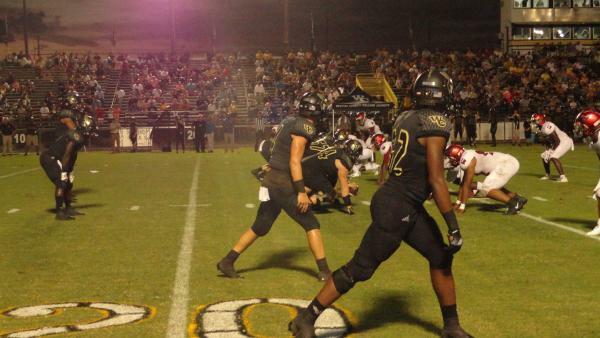 Cribb has offers from Southern Miss and Valdosta State and his academics should attract schools that require higher standards than the NCAA minimum. Believe it or not, the sophomore is the most heavily coveted player who participated in the game. At this time Weston’s dance card is filled with the likes of Georgia Southern, Michigan, South Carolina and Southern Miss. He has made the move from guard to left offensive tackle for the Yellow Jackets which should tell you something about his size, skillset and abilities. But as I have said before the thing that stands out about this young man is his hip and knee flexibility. This allows him to uncoil with maximum power and leg drive. Franklin does a great job of moving his feet once engaged during run blocking. Look for him to project as an athletic guard or possible center at the next level. This young man is one of the most unheralded backs in the entire state and that should simply not be the case. Fuller is chalked full quick-twitch muscle fiber and he has the speed to take it the distance. On the evening he carried the ball 18 times for 164 yards and one touchdown, he also had one catch for ten yards. Most fans would say his 80-yard touchdown scamper to start the second half was the most impressive play of the night. But for me it was his 13-yard run on fourth and short late in the last stanza that caught my eye. Fuller was struck squarely in the hole, but displayed immense power and balance to continue his forward momentum. That play all but ended any miracle comeback by Glynn Academy. For recruiters still wondering if he will qualify; Fuller just received a 17 on the ACT and is now on track to meet NCAA requirements. He is not a small all-purpose back, but an every down back that gets logarithmically stronger as the game goes on. The Citadel commit has been flying completely under the radar for two years now. Most recruiting pundits don’t even know he has committed to a quality FCS school. Last year Rogers played at around 240-pounds, he has increased his muscle mass immensely since then and now could project as an interior defensive lineman. What Rogers lacks in length he makes up for in lower body muscle mass. In the game versus Glynn Academy he recorded five tackles from his standup end position. It’s still hard to believe this thick defender possesses extraordinary lateral movement, which allows him to chase plays to the boundary. His size increase could improve his stock in the eyes of recruiters. Vann is your prototypical run mashing offensive lineman that runs his feet after initial contact. He is also the other Wayne County lineman that has added considerable quality muscle mass since last season. I understand potential tackles are always the hottest commodity, but this future guard lacking offers at any level is a head scratcher. In my opinion Vann has FCS ability, he is qualified but improving his test score could attract those schools that require higher academic standards. Vann showed out this past spring at the ESPFC annual football camp, where most of his evaluation was based on pass protecting. He won that award over several more highly sought after prospects.